Schema.org: what it means for you and your library! Does anyone have a solid answer? Discovery layers solved all of our users' problems, right? AKA "Machines are not welcome here." While I expect this sort of nonsense from web-hostile proprietary library systems, it was surprising to me to find that even many of the free-as-in-freedom library systems use an absolutely restrictive robots.txt file. So why should we trust them to get us to a working linked open data world? Evergreen, VuFind, Koha, for example, already expose structured data and generate sitemaps out of the box using the same old MARC21 data. Evergreen even exposes information about libraries (locations, contact information, hours of operation) so that you can connect its holdings to specific locations. This is the schema.org data from a record detail page taken from an Evergreen catalogue in the wild, as hosted by MVLC in Massachusetts. The rendering is courtesy of RDFa Playground. 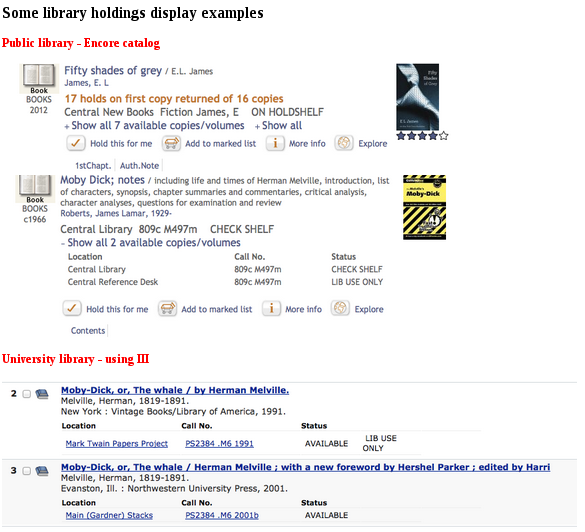 This is the schema.org data from a library page taken from an Evergreen catalogue in the wild, as hosted by Bibliomation in Connecticut. 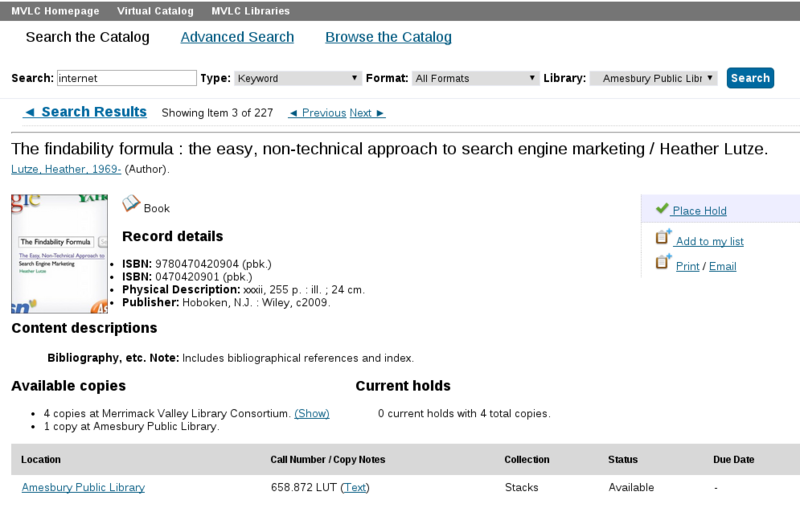 The library page is linked from the Holdings-as-Offer entities on the record details page; Evergreen enables you to link to your own library web site instead. But of course you can use the Evergreen-generated page as a template for ensuring that your own site contains the appropriate schema.org data. schema:reviewBody """The temple dedicated to Castor and Pollux...""" . schema:publisher "\"L'Erma\" di Bretschneider" . roleName is not quite there yet. Promoting "namedPosition" to Role and renaming the property "roleName" or the like sounds good to me. From static structured data to APIs? And schema.org offers much more than just static structured data; schema.org Actions are surfacing in applications like Gmail as a way of providing directly actionable links. See also Hydra for defining self-documenting machine-actionable RESTful APIs. Making catalogues "of the web"
All materials available for free under a CC-BY-SA license! A location from which this offer is available (e.g. a store, a bus stop, a gas station,...). A location schema:availableAtOrFrom from which this offer is available (e.g. a section of the library). Hey, it turns out AbeBooks.com uses Product / Offer! It was nice to participate in a group in which the discussions were not purely theoretical, but grounded in practice (even if I was the one doing most of the grounding at the time).